I am sure all crafters agree that buying supplies is a lot of fun. Who can resist the multitude of alluring embroidery floss colours? Why wouldn’t you want to treat yourself to a new tool that makes the job in hand a little easier? I certainly can’t! However, our recent move abroad has changed things a little. When we came to Italy last summer, we could only bring whatever would fit into the back of our car. This meant my craft supplies were limited to one basket, making way for fripperies like clothes and bedding! Upon arriving here, it has taken time to find craft or supply shops. Our postal service hasn’t been very reliable so I haven’t yet attempted any online orders. My intention was to use this year abroad, in part, to develop all of my creative ideas. So I had to resolve not to let limited craft supplies get in the way of that. I did wonder how I would get on with simply having to work with what I had to hand. Having been here for seven months I can honestly say that, far from being a hindrance, it has actually helped me to be more creative. It has also curbed my tendancy to procrastinate. You know how it is, “I will start that once I have bought such and such”. Instead I just have to get on with it! There are, of course, supplies that are necessary but I have managed to work around most things. I was running out of those bobbin cards that keep all of your threads in order so I used one as a template and traced several onto some card. I cut them out and they were perfectly useable! I don’t think I will always be like this. After all, it can often take more time and effort to work this way and, quite frankly, I like buying craft supplies! But it has been a useful exercise. I would encourage anyone new to crafting to just get stuck in and resist the temptation to spend too much money on your new hobby – at least to start with anyway 😉. It it has got me thinking about what tools I absolutely cannot live with out. I will have to try and make a definitive list. If you had to limit your craft supplies to one basket, what would you be sure to include? I LOVE buying craft supplies, but it is a very rare thing for me. I love to upcycle fabrics and find ways to even use those ‘ugly’ ones we all have. Not buying craft supplies for sometimes 6months+ at a time lets me get super creative with my ‘leftovers’ and try new things! I recently found some embroidery threads in a box and tried it for the first time- and now I love it. The only things I can’t live without are the basics really – crafty inspiration and materials can come from anywhere! (I have once even done painting with food dye and coffee when I ran out of paints haha). 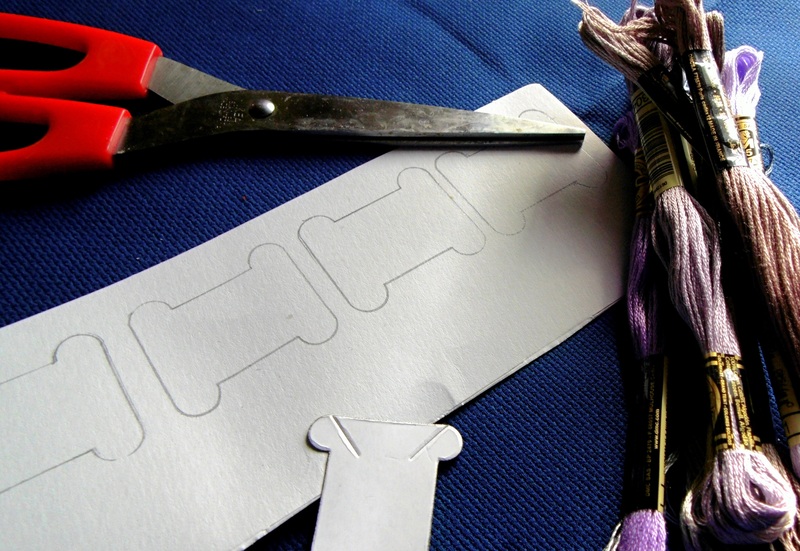 I love your post and will be using the thread holder idea – a great way to recycle too! Fantastic! I like your approach to crafting! I got given a big bag of really old floss – I don’t even recognise the name of the company on the label. When friends know you stitch they will often give you stuff they bought when they were going through a crafty phase!